Many of the best public schools in the Dallas Fort Worth area are located in north Dallas suburban communities. This 2018 analysis of the DFW metroplex's top public high schools ranks 24 of the high schools located in these suburbs among the top 24 open enrollment public high schools. As shown on this best Dallas Fort Worth school districts page, 20 of the top 25 ranked school districts serve the north Dallas suburbs. Both of the analyses referenced above are based in total, or to a large extent, on students performance on the annual State of Texas Assessments of Academic Readiness (STAAR) tests. The percentage of total student tests for all subjects tested that met or exceeded TEA STAAR achievement standards is known as the Student Achievement Index. More about how the TEA evaluates district and campus performance is available by clicking on this TEA accountability guidelines link. 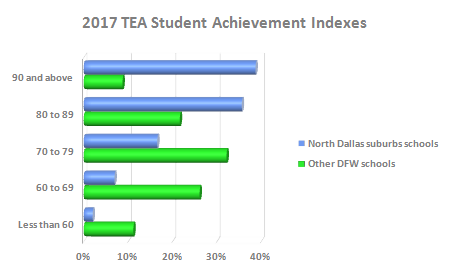 At the campus level, the 2018 Student Achievement Index attained by 39 percent of the schools attended by students residing in the north Dallas suburbs was 90 or above. About 36 percent of these campuses attained a Student Achievement Index between 80 and 89 and 17 percent were between 70 and 79. The Student Achievement Index of 7 percent of the public schools in the north Dallas suburbs were between 60 and 69 and only 2 percent of these campuses was below 60. By comparison, only 9 percent of other public schools in the DFW metroplex had a Student Achievement Index higher than 90, 22 percent were between 80 and 89, 32 percent were between 70 and 79, 26 percent were between 60 and 69, and the 2018 Student Achievement Index attained by 11 percent of other schools in the DFW metroplex was less than 60. Performance profiles for all of the schools serving the north Dallas suburbs are available by clicking on the names of the school districts listed below. Performance evaluation information for each campus, such as STAAR tests results and Advanced Placement (AP) and International Baccalaureate (IB), SAT, and ACT scores for high schools, along with student population by grade, campus address and main phone number are provided in these profiles. Serves all of Argyle and the northern half of Bartonville, plus The Estates at Tour 18 and one other subdivision located in northwest Flower Mound. Serves most of Southlake; all or part of 16 subdivisions located in northwest Grapevine, including Cannon Homestead and Lakeview Estates, and the Glenwyck Farms and Terra Bella subdivisions located in east Westlake. Serves four subdivisions located in east part of Coppell. Serves the master planned community of Lantana, the southern part of Bartonville, the west side of Copper Canyon, the west end of Double Oak, and five subdivisions located in northwest Flower Mound. Serves most of Colleyville and Grapevine. Serves eight subdivisions located in south central Colleyville. Serves most of Keller, all or part of eleven subdivisions located in northwest Colleyville, including Clairemont, Remington Park and Westmont, about 20 subdivisions located in Southlake that lie west of Davis Boulevard / Randol Mill Avenue and the Vaquero subdivision in northeast Westlake. Serves all of Highland Village and most of Flower Mound, Copper Canyon and Double Oak, one subdivision in north Coppell, portions of the Lakes on Legacy Drive and Stonebriar communities and the Heritage Lakes subdivision in southwest Frisco, plus the Kings Gate and Kings Ridge subdivisions and portions of six other communities and subdivisions, including Prestonwood Hills and Shoal Creek, in west Plano. Serves all of Trophy Club, two subdivisions located in the west end of Flower Mound, three subdivisions in northeast Keller, and six subdivisions located in the northwest part of Southlake that are located in Denton County. Serves much of west Plano.